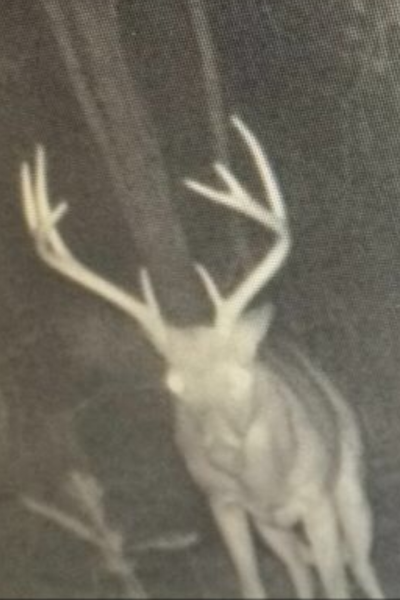 Last Saturday Oct 18 I got into the box stand in hopes of seeing the tall 8 point that we have had on camera. We new he was in the area and deer had started pushing does around, making their scrapes, and hitting antlers together. Around 5:30 a doe ran across the path at 315 yards followed closely by a small 6 point. About 10 minutes later he walked out right behind the first buck. I steadied and squeezed one off to see him huntch over and take off into the woods where he came from. I felt that I hit him but maybe in the guts by his reaction. My cousin and I went to check for blood and there was nothing. Talking about disgusted. I went back the next morning and found nothing. I was really hoping that I missed and didnt wound the buck. The next day I decided to put a ladder stand up where they were crossing and where we had seen him a couple of times before. My cousin sat the stand on Wednesday and he stepped out at 40 steps. Unfortunately he was not ready and the buck saw him before he saw the buck. This relieved me to know he was still alive and still on his pattern. So I decided Thursday to get in the ladder stand at 4:00 and be ready for him to be going to the beans for dinner. at 6:00 a small buck crossed the path in front of me. No sooner that 3 minutes I heard bucks fighting in the woods 50-100 yards in front of me. I grabbed my rattle bag and gently rattled followed by a couple grunts and then a bleat, in hopes of bringing them to me. 5 minutes later with only about 10 minutes of shooting light left he walked out in the lane 30 yards from me. I had already gotten my gun on the rail waiting and after identifying him quickly I stopped him and let him have it. He dropped in his tracks. It was very rewarding for us to get this buck on the ground because we patterned him saw him and moved locations to get him. Very good start to the 2014 hunting season. Now on to the next big buck on cam.